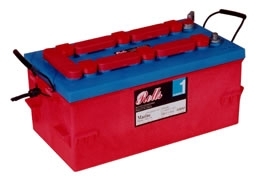 Rolls Surrette batteries are known for their rugged, dual container construction. Each cell is encapsulated in its own inner container made with a high grade, polypropylene shell and its own heat bonded cover. The cells are then further protected with a second, high-density, polyethylene outer container. These safety measures allow the battery to still be operable should the outer container break, eliminating the hazard of a toxic sulfuric acid spill. Rolls Surrette cells feature double insulated positive plates. The first layer utilizes a thick woven glass mat, which then is sealed in a non-destructible micro porous polyethylene envelope. The protective envelope reduces the possibility of separator misalignment, cracked separators, or shorting at the bottom or sides. This also allows the sediment chamber to be eliminated, creating more space for liquid at the top of the battery, thus lengthening periods between watering. Weight: 82kg ; 181 lbs.